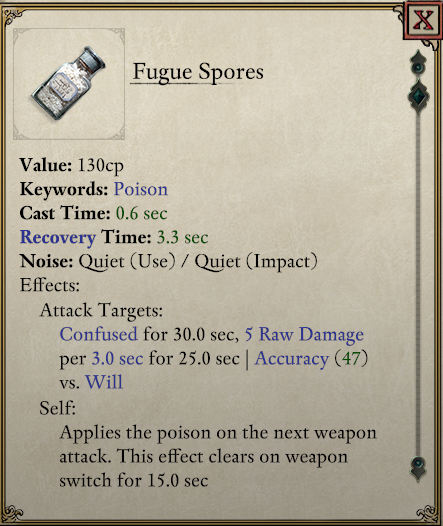 He probably meant Fugue Spores poison which we can craft. P.S. I've tried that poison on Giant Cave Grub right now. In my case Confusion effect gets upgraded (as intended) (see screenshot). But the Grub doesn't get charmed. Although that's most likely due to Charm being removed by friendly fire damage now. And perhaps the DoT ticks qualify as such? Edited by MaxQuest, 11 April 2019 - 11:22 PM. I don't have any mods. the DoT instantly dispelling charm may be what's happening (but man, that seems like a broken interaction that a weakness to intellect actually makes the poison worse because then you don't even get the confusion), but I would swear 100% for all time, that my combat log said "resisted" not "strengthened". Either MaxQuest has a special mod to clarify that interaction in the combat log, or I fell into a weird edge-case (possibly on Wael's mode something weird happens). I've been busy so have not been able to go back into my older games, but is SChin saying that even my original OP with the putrid blast is not reproducible? what about the cases where resistance causes the resisted afflictions to have no listed durations (same thing with weakness iirc)? Edited by thelee, 15 April 2019 - 07:57 AM. True that. Although the resistances and that encounter were designed before Charm effect got nerfed. but I would swear 100% for all time, that my combat log said "resisted" not "strengthened". Either MaxQuest has a special mod to clarify that interaction in the combat log, or I fell into a weird edge-case (possibly on Wael's mode something weird happens). I have a few mods, but nothing special or remotely related to getting extra info, at the moment. Is there any chance you have seen resisted against stun/paralyze/terrify that would potentially land at the same moment? If not... it's indeed some Wael shenanigans. I didn't see him saying that. P.S. Hmm, the save file in OP is related to that Putrid Blast issue, right? I'll try to replicate it... when I'll have time. Edited by MaxQuest, 15 April 2019 - 09:21 AM. 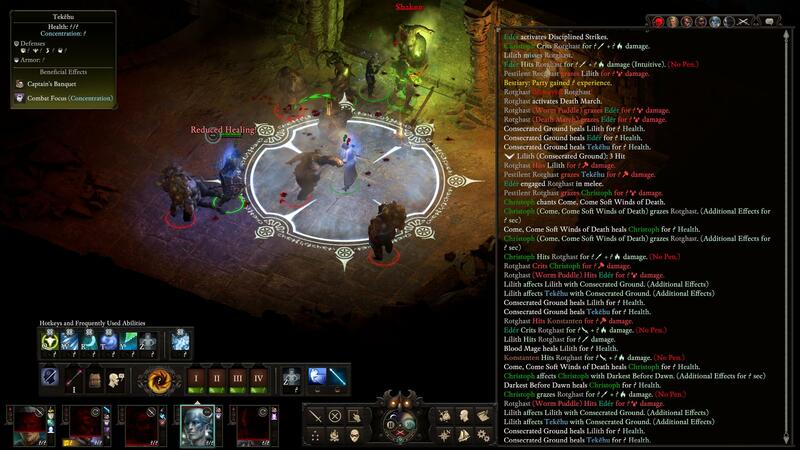 Hey so no mods for me, and any time I had a debuff on my party and I tried to use suppress affliction, nothing happened and the affliction stayed on the party. Have been able to replicate it. But had to really try for that to happen. - loaded your save, ran into those rothgasts and... no one is using Putrid Blast. - after 2 minutes of watching, reloaded the save and... still nothing. The cast other spells, but not the Blast. 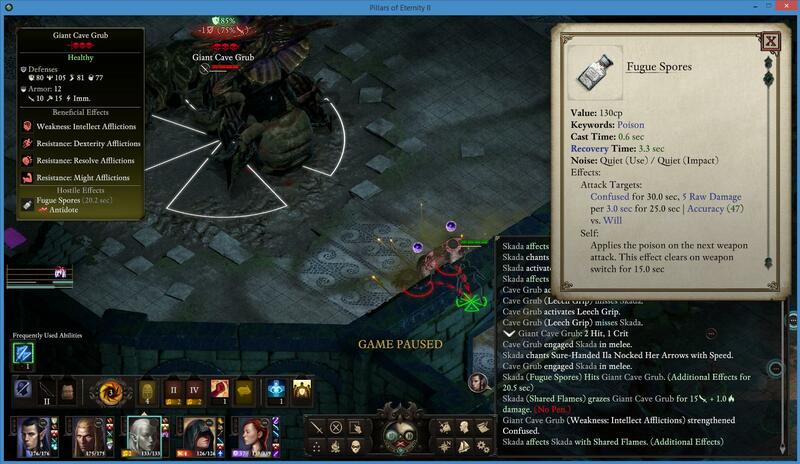 But have noticed Tekehu getting "Reduced Healing" overhead text on each tick of Consecrated Ground (screenshot). Even through he wasn't affected by any debuff at all starting from the very start of combat. - reloaded the save again. Rested with just water. Disabled Tekehu and Lillith AI. Still nothing. Rothgasts don't cast Putrid Blast. - reloaded the save again. Rested with just water. Disabled Tekehu and Lillith AI. Sent everyone to be close together. And now I've finnaly got some Rotghast to cast Putrid Blast. Perhaps it's in their AI to cast it only if they can cover 4+ enemies or something. Putrid Blast sickens and immobilizes. If Tekehu uses his Shark From, the game shows that Immobilized effect is waved from him, but he still can't move. And the game shows that this is due to sickened effect. See screenshots. I imagine this still has not been resolved? It should be with the next patch hopefully. I hope so because it makes the game semi-unplayable. They have trouble reproducing the bug on their end. But it seems they are waiting for this to get fix before releasing the patch. I see a lot of complaints about this bug. But when I asked around for savegames, screenshots, videos or other hints how to reproduce it I didn't get a lot of feedback. I mean I could make a video of some sort but if they cannot find it, it might be unsolvable. They cannot reproduce it. At least that was the last thing I heard. Maybe it "accidentally" got fixed while doing other stuff. I need to test it again but last time I tried Afflictions were all messed up still. Maybe they are using a more recent game build. But when I do testing stuff with the console I also have troubles reproducing it. It seems you have to meet special circumstances in order for it to occur. Edited by Boeroer, Yesterday, 11:16 PM. My File was too large so I emailed it too them directly. Weren't you the first one to point it out? as in Suppress Affliction not working? How did you get it to work? No, that was thelee. I had problems with afflictions not getting removed by fitting inspirations. But when I start a fresh playthrough I can't reproduce it either. Edited by Boeroer, Today, 04:39 AM. One thing to keep in mind Aarik D said in discord there was a bug that was alluding them that they were waiting for. I speculated that it may be this one since the devs were responding recently in this thread saying they couldn't reproduce it but it could be another bug. i would be curious which one if its a different one. seems like the community would def try to help. So it is fixed for you now?? Suppress Affliction removes debuffs?